Do you work with children whose anxiety is overwhelming them, who shy away from participating in new activities or taking on challenges because they are afraid to fail….or you worry they’ll choose harmful coping mechanisms as they struggle with the stress of their lives? When children can’t cope, challenges become stressors, and anxiety replaces anticipation. Our kids can’t enjoy childhood to the fullest, their learning suffers, and their long-term resilience is compromised. Kids often get a message that their anxiety is something to get rid of or push away, but like all emotions our anxiety has a job to do. Join Mayuri Gonzalez, kids’ yoga and mindfulness expert, in this interactive seminar to discover how to teach our kids to better understand their own experience, and find effective ways to meet their needs and engage in their lives from a place of personal power and agency. You’ll walk away with a new framework for relating to anxiety, along with concrete practices to help your clients and students learn to access their inner resources, calm their anxiety, transform their relationship to stress, and thrive even when life is challenging. Consider the impact of family, school, media and global events on children as it relates to anxiety and treatment options. Identify various forms of anxiety, and learn to use anxiety as an information gathering tool. Build client capacity to identify rising anxiety before it becomes overwhelming or debilitating. Learn to manage escalating emotions and intrusive thoughts with embodied practices. Develop differentiated strategies to address anxiety rooted in building self-awareness, capacity and confidence. Enhance resilience through personal and partner-based practices. What is Causing Rising Childhood Anxiety? 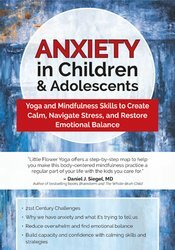 Assessing for Anxiety - How Do Kids Cope? Why Do We Have Anxiety and What is it Trying to Tell Us? Anxiety as necessary and functional – we all have it! What happens when anxiety becomes mal-adaptive?